Background: The gain of genes is thought to play important roles in the adaptation and diversification of plants. Loss-of-function mutations lead to pseudogenization or gene loss, which might contribute to adaptation and diversification as well, but this topic has been largely neglected. 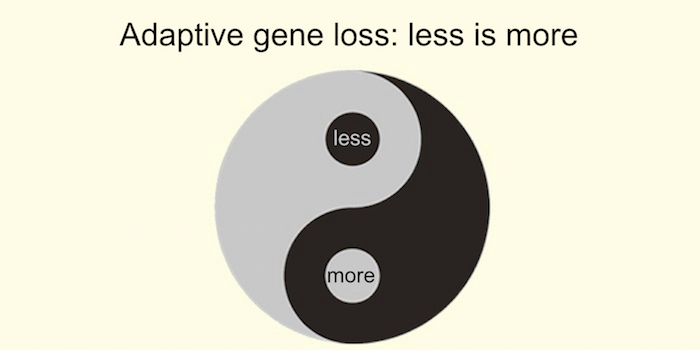 The “less-is-more” hypothesis proposes that gene loss functions as an engine for evolutionary change. Most loss-of-function mutations are neutral or deleterious, but the extent to which loss-of-function mutations contribute to adaptation and phenotypic diversification is largely unknown. Question: Taking advantage of more than 1,000 resequenced Arabidopsis thaliana genomes, we investigated the effect of natural loss-of-function mutations on the adaptation and diversification of this model plant. Findings: We systematically identified 60,819 loss-of-function mutations across 1,071 Arabidopsis genomes worldwide. Intriguingly, 34% of A. thaliana protein-coding genes do not have any loss-of-function mutations, implying that loss-of-function mutations in these genes would reduce plant fitness in natural environments. Furthermore, in the Yangtze River basin population, 1% of genes with loss-of-function mutations were under positive selection, suggesting these loss-of-function mutations are closely related to adaptation. Next steps: The mechanisms by which loss-of-function mutations produce functional effects are complicated. We plan to perform in-depth studies investigating how loss-of-function mutations affect plant adaptation. Key words: adaptation, Arabidopsis thaliana, less-is-more hypothesis, loss-of-function.